U.S. Supreme Court Justice Ruth Bader Ginsburg fractured three ribs in a fall in her office at the court and is in the hospital, the court said Thursday. Supreme Court Justice Ruth Bader Ginsburg fractured three ribs in a fall in her office at the court and is in the hospital, the court said Thursday. The court's oldest justice fell Wednesday evening, the court said. She called Supreme Court police to take her to George Washington University Hospital in Washington early Thursday after experiencing discomfort overnight, court spokesperson Kathy Arberg said. Ginsburg, 85, was admitted to the hospital for treatment and observation after tests showed she fractured three ribs. Ginsburg has survived bouts with colorectal cancer and pancreatic cancer, and had a stent implanted to open a blocked artery in 2014. 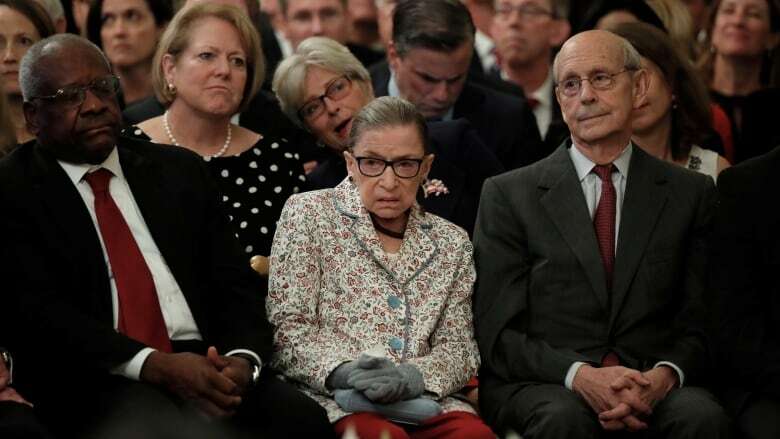 Despite those medical issues, she has never missed Supreme Court arguments. The court won't hear arguments again until Nov. 26. Rib fractures are common among older adults, particularly after falls. The severity depends in part on whether the ribs are cracked or broken all the way through, and how many are broken. The extent of Ginsburg's injuries was not clear. Ginsburg, the subject of a recent documentary on her life, RBG, was nominated to the Supreme Court by then-president Bill Clinton, taking the oath of office in early 1993. She is the eldest of the justices, but has not indicated she plans to retire anytime soon. Ginsburg leads the court's liberal wing. She rebuffed suggestions from some liberals that she should step down in the first two years of President Barack Obama's second term, when Democrats also controlled the Senate. President Donald Trump has appointed two justices, Neil Gorsuch and Brett Kavanaugh, since taking office, tilting the court to the right. Gorsuch was elevated after Obama's nomination of Merrick Garland was not backed up by the Senate. In an interview during Trump's presidential campaign, Ginsburg called him a "faker" who "really has an ego." She later apologized for what she said were inappropriate remarks. In Ginsburg's absence, the court went ahead Thursday with a ceremony welcoming Kavanaugh, who joined the court last month after a highly contentious process. Trump and Matthew Whitaker, the new acting attorney general after Jeff Sessions was forced out, were on hand.